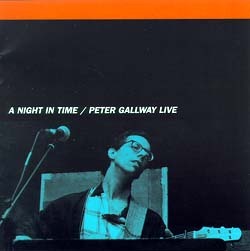 Peter Gallway "A Night in Time: Peter Gallway Live"
From his early major-label albums with the Fifth Avenue Band to his more recent solo albums, Peter Gallway has created a body of work that has won his long-term fans who know they can always expect something good from his jazzy urban-soul-folk. For this live recording, Peter revisited and reworked 15 cuts he has recorded over the years and also includes two new songs. The CD booklet aso includes Peter's notes about the songs.